↑ Hovasapyan, Zara (১ আগস্ট ২০১২)। "When in Armenia, Go Where the Armenians Go"। Armenian National Committee of America। Made of local pink tufa stones, it gives Yerevan the nickname of "the Pink City. ↑ Dunn, Ashley (২১ ফেব্রুয়ারি ১৯৮৮)। "Pink Rock Comes as Gift From Homeland in Answer to Armenian College's Dreams"। Los Angeles Times। To Armenians, though, the stone is unique. 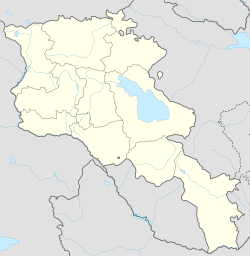 They often refer to Yerevan, the capital of their homeland, as "Vartakouyn Kaghak," or the "Pink City" because of the extensive use of the stone, which can vary from pink to a light purple. ↑ "Old Yerevan"। yerevan.am। Yerevan Municipality। Since this construction material gave a unique vividness and specific tint to the city, Yerevan was called "Rosy city".